Welcome to ORSM Designs,We don't just settle for good, or even great. We only settle for awesome. Being in the Gold Coast Renovation industry for 20+ years, we know our way around, and have made excellent contacts with all aspects of renovation needs. We are a small family run company which assures you with excellent personal service, quality and true thoughtfulness in everything we do. Fully licensed, and insured, and a member of Master Builders. Gold coast kitchens are our specialty. We get great enjoyment out of designing and viewing the end product which in turn changes the whole outlook and feel of your home, such a simple thing make such a big impact. Gold coast Kitchen manufacturer, using only high quality parts and materials. We can do kitchen renovations in houses, high-rises, duplexes and in complex's. We do work for real estate agencies, builders, property developers, investors, insurance companies and of course for the public. Personal kitchen design, to utilize the area in the most efficient way. A whole brand spanking new kitchen. A re-face, which means just the doors, paneling and bench-tops with maybe a few other modifications, For near new kitchen. Complete organization from start to finish of the project , which means taking care of all trades involved, making it hassle free..
Electronics, which means self opening doors and draws, electronic lift microwaves, and flap doors. Now that's for a fully high-tech and modern kitchen. LED lighting, which really sets off and makes a feature out of your kitchen. We can even put them inside your cupboards so when you open the doors, everything is easily visible. Multi-function items. Perfect for the small house or units Kitchens, which means things like drawers that open up and turn into ironing boards, bench tops that extend out and turn into tables and lots more, imagination is the limit. We love doing top-quality kitchens, with originality, functionality and eye pleasing. We do budget kitchens also, because we understand that money is tight these days. Everything is done according to Australian standards and our high standards. We keep our overheads down so we can keep all the prices down. Everyone that is working in our business, we keep with a happy mindset which insures quality and pride. So what are you waiting for, email or call us today to make an appointment that will change your house into a home. Gold coast bathroom's seem to be the most neglected room of the house. You're in their, do your business and get out ASAP. That shouldn't be the case. Because once where through renovating your bathroom, it will be a place for relaxation and me time. You'll be really surprised on how a nice, new renovated bathroom does to your mindset. Gold coast bathroom, manufacturer and supplier of high quality parts and material. 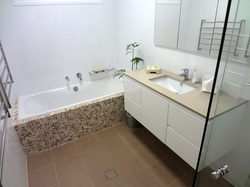 We can do bathroom renovations in houses, high-rises, duplexes and in complex's. Total redesign from wall ceiling. Get a total fresh look. A simple and quick refurbishment. Quick, cheap and easy and still very effective. Remodel. May include ripping down walls and changing location of the toilet and shower position. Getting extra bathroom. Putting in a much-needed ensuite or second bathroom to the house. Again we can take care of all the trades leaving it a hassle-free process for you. So go on, pamper yourself and your family, email or call us today to make an appointment. Have a look at our previous projects and renovations here.